This would make a great gift for yourself or someone you know who may have attended Boot Camp in the 60s, 70s or 80s. A nice rare military collector’s item. You will not be disappointed. Most of the books photos are generic to any company that went through the training. About 25% of the book is specific to Company 061 in 1986. 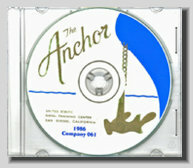 The Book includes over 100 pages of high resolution color and black and white images of life in naval boot camp. More than 200 general pictures depicting life in Boot Camp no matter when you went through it. Personal Pictures taken July of 2005 of the former San Diego Boot camp as it looks now.